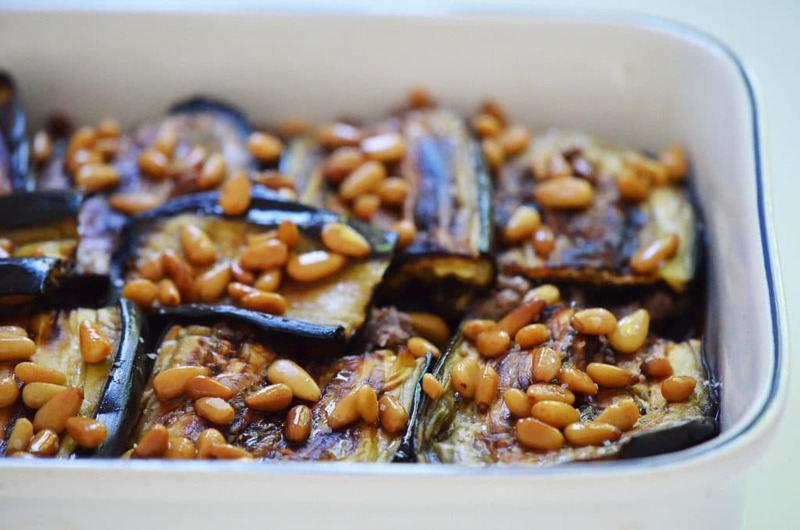 This Lebanese eggplant dish, Sheik al Mehsheh, is so incredibly savory and delicious! Meltingly soft eggplant, tomato sauce, and ground beef or lamb studded with toasted pine nuts, and topped with cheese (Mom’s addition! )–you will LOVE. I started falling for boys at a fairly young age. In elementary school, each year there was at least one heart-throb who I loved from afar, yearning to stand in line behind him in the cafeteria or get placed on his team for kickball. There was a pair of red striped Adidas, not my usual style, that I insisted on because my little boy crush had these shoes, so surely he’d notice mine. It was during my teen years that I started to understand what passion, “to suffer,” meant when a boy I was going with shifted his affections to another girl. I heard her favorite color was pink. I promptly bought a pink Swatch. I can be pretty in pink just like her, I thought. My childish ways extended into a week-long moratorium…on eating. It was easier than telling my parents what happened. I just didn’t talk about those sorts of things, figuring that the gulf between what they knew and what I knew was not to be forged (of course I thought I knew more than they did), and I don’t think they were even aware I had this boyfriend. The longing and refusal to eat seemed to compliment my longing for love. Can’t have love, won’t eat. So there. My mother, unable to get me to tell her why I wasn’t eating, turned to the seduction of her kitchen. She baked cookies and cake, thinking my sweet tooth would bring me down. I held strong. She made macaroni and cheese and my all-time favorite, fried chicken. I sat at the table and willed myself not to eat it, probably one of the more challenging moments of self-denial I’d had at that point in life. That evening my father reached the limits of his patience, and offered me an equally challenging show-down in which he demanded to know what in the $%! @ was going on. His approach left me further resolute…and hungry. 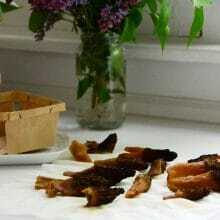 The next day I came home from school and before I set foot in the door, the aroma of roasting eggplant hit me. From the oven emanated the scent of bubbling tomato sauce deeply enriched with eggplant, ground beef, onion, buttery pine nuts, and cinnamon. 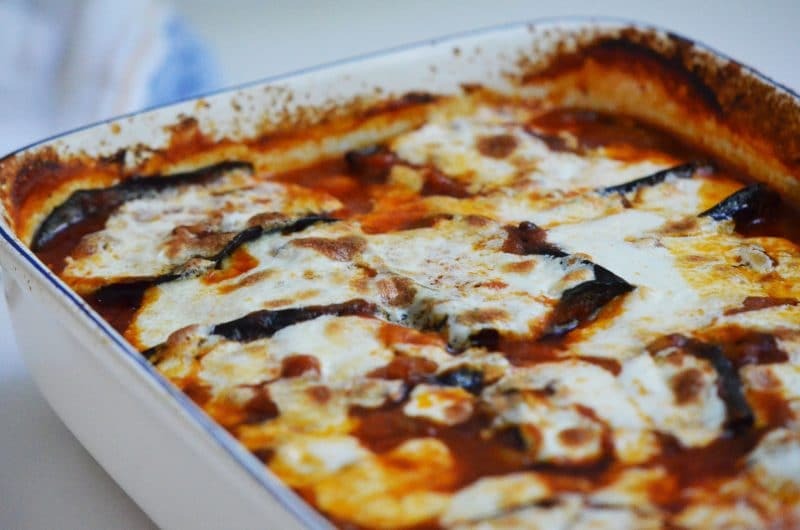 My mother asked me to check on the sheik al mehshee, traditionally a Lebanese stuffed eggplant dish that she had turned into an even more delicious layered gratin. I opened the oven door and was overpowered not just by the aroma, but the vision of the topping of melting, golden cheese. The mozzarella was not out of her book of Lebanese cookery, but probably borrowed from the techniques of our Italian neighbors across the street. A little bit of cheese on top just added to the succulence of the dish. She asked me to make the rice, with its handful of toasted angel hair pasta to give the rice another dimension. As I cooked with my mother, and thought about what she’d done for me that week in the kitchen, it hit me that everything was going to be ok even without the boy. That the winds of teen love might shift without notice, but the love of my family was here to stay, and that wasn’t so bad after all. That night, I ate my fill and slept more soundly than I had in a while. By the next morning I had snapped out of it, and was back to my old self again. For most every homecoming of her five children from college and then their various domiciles, my mother sets to making her sheik al mehshee. She knows that its scent will pull her children to the kitchen, to the table, to her, and open them up to remembering who they are and where they come from, no matter what kinds of aches and pains have wounded them along the way. What she doesn’t perhaps realize is that coming home to find the mouthwatering scent and flavor of sheik al mehshee in her kitchen is nothing compared to finding her there, waiting for us. Line a baking sheet with foil or parchment. Trim the stem from the eggplant. Cut the eggplant in half crosswise (the shorter cut), then cut each half lengthwise in 1/2-inch slices. Brush both sides of eggplant slices with olive oil, and season one side with a teaspoon of salt. Arrange the eggplant on the prepared baking sheet and broil it in batches until it is deep mahogany brown, turning once to brown both sides. 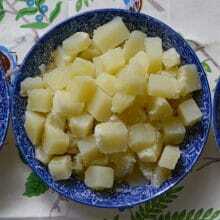 In a small frying pan, melt 1 tablespoon of butter. 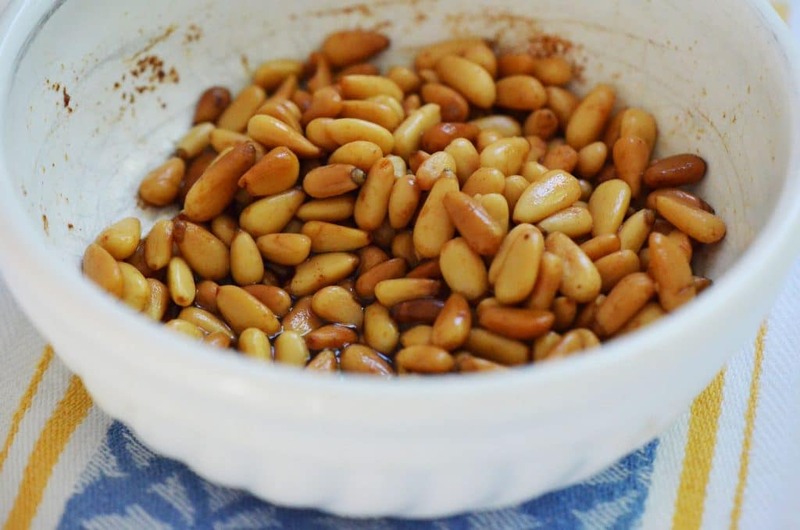 Add the pine nuts and cook them, stirring constantly, until they are golden brown. Remove from heat and set aside. In a medium sauté pan, melt the butter over medium low heat. Add chopped onion and cook over medium heat until translucent but not browned, stirring occasionally. Add the garlic and cook just until fragrant, about a minute. Add the ground lamb or beef, breaking up the meat into very small pieces with a spoon. Season with salt, cinnamon, and pepper. Cook until the meat is medium-well done, continuing to break up the meat into small pieces with a spoon. Butter or oil a 13 x 9 x 2-inch baking or similar sized gratin dish. Spread about ½ cup of tomato sauce in the bottom of the dish. 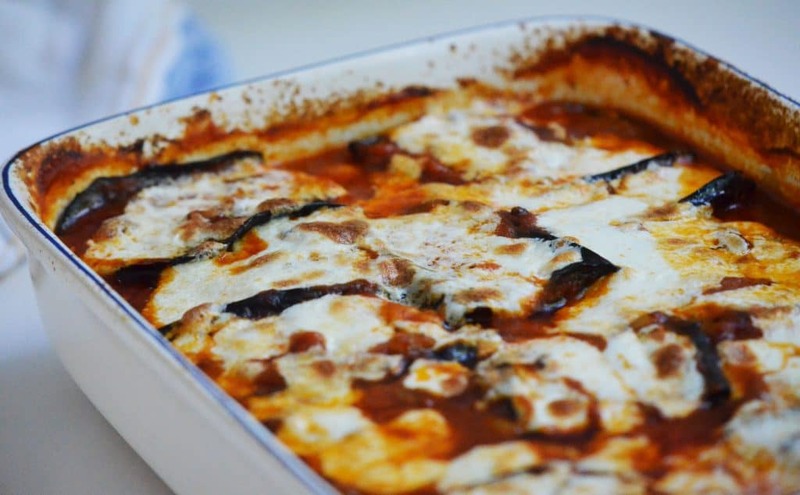 Place eggplant slices over the sauce, covering as much surface area of the bottom of the dish as possible. Spoon half of the meat evenly over the eggplant and pour half of the remaining tomato sauce over the meat. Sprinkle with half of the pine nuts. Now layer again with eggplant, meat, pine nuts, and tomato sauce. Finish with a layer of eggplant and cover that with more tomato sauce. Pour enough water around the edges of the dish to fill the gratin a little more than halfway. This is an important step or your sauce will be too thick; it may seem watery when you do this but the sauce will thicken as it bakes. Cover the pan tightly with foil and bake for 90 minutes. Remove the foil and sprinkle with crumbled fresh mozzarella cheese. Bake for about ½ hour longer, uncovered, until the cheese is bubbling and golden. Serve warm, over rice. 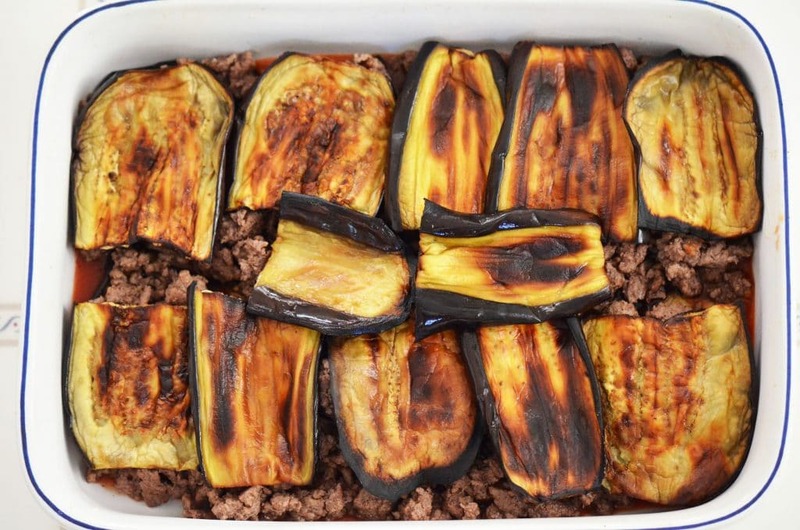 60 Responses to "Sheik al Mehsheh: How eggplant healed a heart, and always welcomes us home"
Thank you for the sweet story that accompanies this recipe. You reminded me that we can taste our memories, both the pain and the love, as surely as we can vividly recall the nourishing dish that healed us. Thank you Tom–I love that idea that we can ‘taste our memories’! Beautifully said. Maureen, you are truly amazing and I LOVE your writing! I can so hear your voice in this. Let’s not wait until a trip to France for you to share another story with me in person. Oh Kevin…thank you…and yes, soon. 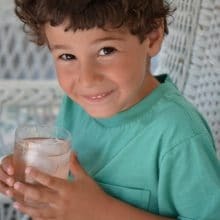 Your recipes keep me in the kitchen “just a little while longer” and your writing keeps me coming back to your blog for more…it so heartfelt! Maureen u are amazing I enjoying reading ur writing and the cooking and pics are great ur the best harbor springs is the place for u keep it up love u and my aunt Mary talk soon!!!! Love you Alberta. Come see us soon. Sweet story, that ring so true; this sheikh al-mehshi, with the twist of cheese instead of yogurt is really alluring! Will try it next time. Maureen, if I didn’t know better, I would think I/we were the Italians next door. Our childhood memories are strikingly similar: family first, resolute personalities, and a kitchen table that was the hub of the universe. Thanks for the recipe — a little variation (with the pine nuts) on a family favorite! Maureen, Loved loved loved this one!! You are a true artist with your words. What a wonderful story — and such a tribute to your mom — and all moms who cook with love! It’s the reason this food exists…wonderful women over the centuries figured out how to put love and food on the dinner table because they didn’t have time get both done separately for the entire family. I know the aroma of my mother’s kitchen….The home is magic when she’s cooking. I took my life lessons from the kitchen because that’s where my mom was in the morning and when I came home from school. Those talks weren’t easy but they always smelled good. It’s the reason this food exists…such truth. Thank you, Bryon. 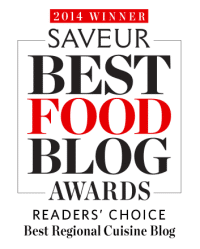 Love this column, as always, and love the recipe–one of my favorites to eat, and, to cook! I make it vegetarian style, and use 1/4″ thick slices of onion instead of the meat. And, yes, lots and lots of cinnamon– (the two things hardest for me to give up when I became a vegetarian 21 years ago for ethical reasons, was kibbeh and sheish barack [forgive my horrible spelling]. I think perhaps a few of us have a simular story. I too can have a flash back at the smell of cookies baking. Thanks for reminding me of those sweet times in life. Thank you for one of the best dinners I have had in a long time! This was fabulous. Yum! I just made this dish (with your serving suggestions) for my New Year’s dinner with friends! Delicious – thank you for the recipe Maureen! Happy New Year! Love your stories almost as much as your recipes, Maureen!!! Thanks for the smiles!! 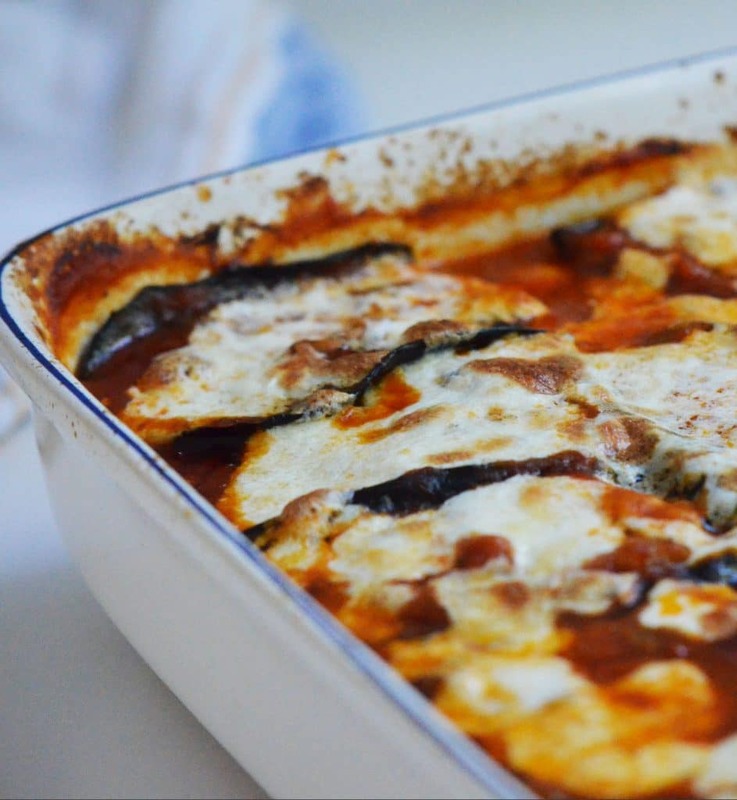 I just LOVE eggplant and cannot wait to try this ! You must be a terrific cook! What a beautifully written post. I can’t wait to try this dish! How kind! Thank you–it is a favorite! I made this tonight at Charlie Abowd’s suggestion – it was delightful! I’m glad to have found your blog and your recipes. Makin’ this for a dinner party 🙂 about how many will your recipe serve? Hi Tara, and thank you! The pan makes about 12 servings, but in our house that serves 6 people! My sister gave me your cookbook last week as a gift and I love it. I made this recipe last Friday. It was DELICIOUS!. It was one of the best dishes I have made in a long time. I would definitely make it again especially for my Lebanese friends. They will go crazy for it!! How great Sara, thank you!! Such a favorite. You have brought tears to my eyes with this story. I miss kitchen moments with my Mother most of all. Thank you for this moment of remembrance. Wonderful story, sister … and so true about the intensity of young love. This isn’t a dish I’m familiar with – is it a regional Lebanese dish? I don’t think this is one my mother made. It sounds scrumptious and I can’t wait to try it. Someone mentioned yogurt as a topping – do you know that variation? Thank you for your stories and recipes. Hi Maureen, what a touching story about your mother’s love. Brought a tear to my eyes. It’s amazing the power of love. Also the scents of food and the people and memories associated with them. P.S. My dad always used to eat a mountain of rice before he had a heart attack( which he survived, thankfully.) His lebanese rice always included crushed coil vermincelli browned with butter. He would later discover Fideo noodles and substitute it with those. I have only seen his family cook with the vermincelli noodles in their rice. Most lebanese rice that i’ve eaten has been made with pine nuts, but not vermincelli. Have you seen this or heard of this? Are these the largest pine nuts, or it seems that way in the close-up pictures? I thought they were white beans. If they’re so large, Where can we get them? By the way, you’re a truely a Lebanese Gem! We love you here in Lyon, Gastronomic City of France. I thought I’d have to wait for fall, but the cool weather we had last week was all I needed to make this dish. My eggplant was not enough to end with a layer, but who cares? It was just delicious! I served it with your wonderful rice and we polished off the leftovers last night. It was even better for hanging around awhile. I also made the Lebanese panzanella salad with the pita crisps. I sprinkled them with salt and sumac before baking. It was the best tomato salad I ever made, and the extra crisps were nice with a glass of wine on their own. Your recipes great! Absolutely–it’s even more delicious on day 2. Bake it all the way, refrigerate when cooled, and then reheat it, covered, in a 350 degree oven when you’re ready to serve. Hi Maureen, I have a question: I was taught by Alice Ellis Abood to peel the eggplants before frying them in oil but it looks like from your picture and recipe that you don’t peel the eggplants. The question is: is that a new improved way of working with the eggplants or just personal preference? The family is showing up for a reunion and have requested Sheikal al Mehshee. Thanks Madonna–I’d say it’s a matter of personal preference. We like the skin and tend to leave it on. In the roasting process it takes on a flavor I like a lot. Have a wonderful reunion! I had tears in my eyes while reading your story ! I absolutely love these previous memories that you share with us ! Priceless ! The cookbook just arrived this week and I already made several recipes, at this moment this is in the oven! I love your cookbook, Im so happy with it. How special and wonderful Christine! Thanks so much! Hi Maureen, I seem to have very similar and fond memories with my mom in the kitchen. The Lebanese household revolves around the kitchen and the preparation of food. I always had to grind the burghul after cooking and drying and also had to turn the mincer when we made kibbe nayee every Sunday, before the days of Magimix. We often had Sheikh El Mahshy and my mom would add mixed spice and pimento to the meat, as well as cinnamon and S&P, and then sliced tomato as a final topping before baking. It is always divine and I often make it for a dinner party and it is always a hit. Love your work. Sahtehn. What great family togetherness you’ve had, John. So special! Thank you for sharing! Are you related to the Aboud’s in Durban South Africa? Hi John–not that I know of, but I have to believe we all are tied back to the same source in Lebanon! I am going to make this. Thank you, Maureen. I love your recipes. Beautiful story. So many childhood memories are evoked by smell. Family recipes are much more than food. Thank you so much Deborah, and so very true about food and memory (and love). I know you’ll enjoy this dish as much as we do! Thank you for this recipe, Maureen. I’m wondering how I might make it without the meat (I’m a vegetarian). Any suggestions? Hi Ellen–you can just keep the meat out altogether. Saute the onions as instructed and use as is, or saute sliced mushrooms with the onion and layer that mixture with the eggplant and tomato. Sounds delicious . . . now I’m going to have to try it too! This dish is so wonderful. I first saw it in my NY Times newsletter and have made it several times. It’s so unique. Mine always comes out a little too watery. Do you have any suggestions? Hi Kimberly–thank you! You can hold back on the amount of water you add before baking; fill to less than half of what you’re using now and that should do it!